Researchers at the U.S. Department of Energy (DOE)’s Joint BioEnergy Institute (JBEI) in collaboration with researchers at the University of California, San Diego, have developed a workflow that integrates various omics data and genome-scale models to study the effects of biofuel production in a microbial host. The development of omics technologies, such as metabolomics and proteomics, and systems biology have dramatically enhanced our ability to understand biological phenomena. Nevertheless the interpretation of large omics data into meaningful ‘knowledge’ as well as the understanding of complex metabolic interactions in engineered microbes remains challenging. This new open-source workflow which integrates various omics data and genome-scale models drives the transition from vision to conception of a designed working phenotype. The findings were reported in a paper entitled “Characterizing strain variation in engineered E. coli using a multi-omics based workflow” published in Cell Systems (published online on Thursday, May 19). 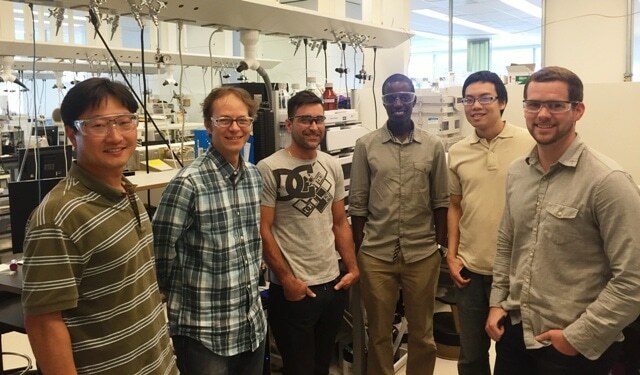 Taek Soon Lee, JBEI’s Director of Metabolic Engineering and Deputy Vice President of the Fuels Synthesis Division is the study’s co-corresponding author along with Bernhard Palsson at University of California, San Diego. Elizabeth Brunk (formerly at JBEI, and currently at UC San Diego) is the study’s co-first author along with Kevin George at JBEI (currently at Amyris). Lee’s team analyzed a large omics data set from eight engineered strains producing three different biofuels, applied the workflow to identify the roles of candidate genes, pathways, and biochemical reactions in observed experimental phenomena, and finally used this approach to facilitate the construction of a mutant strain with improved productivity. “Synthetic biology and systems biology have been considered as two distinct technical frameworks. We hope the confluence of these two fields will benefit biofuels research and its scientific community,” says Lee. “Our team is sharing this workflow as an open-source tool in the form of iPython notebooks, which allows anyone in the microbial engineering field to easily apply this workflow to their system”.